The Weekly Charts for Nasdaq, Gold, Miners, France, UK, Germany, US Dollar and the Euro. Most traders are so short term oriented that they forget to look at the weekly charts. The weeklies will tell you the intermediate trend. 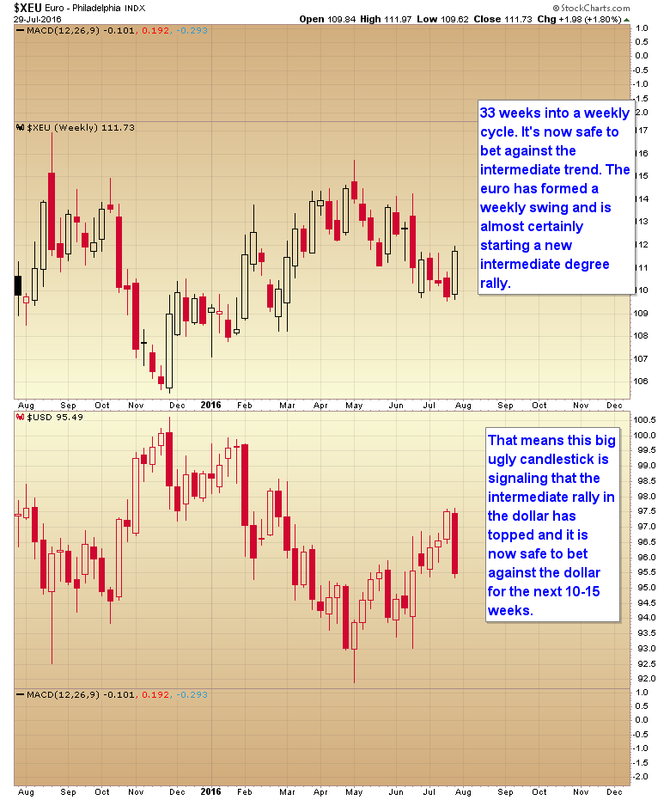 It’s never safe to trade against the intermediate trend unless it is very late in the intermediate cycle. This entry was posted in Uncategorized on July 31, 2016 by Gary. Gary, thanks for your analysis. one thing I disagree with you is that Gold is not in early new IC because Gold and HUI new IC are already 9 weeks after May-June first ICL, extend another 3-4 weeks up, a second ICL will be coming. Is it right? During bull phases an intermediate rally should last 15 to 18 weeks. Gold will be on Week 8. Plus the half intermediate cycle low is now behind us. Should be a strong rally ahead. Driven by the recognition phase of the dollar bear market. Aug and Sep are typical seasonal strong months for PM to support the rally into Aug/Sep.